Compound formulated to be extremely lightweight and flexible. Removable insole with heat relief ventilation holes. Swiveled and removable strap. Ventilated system in the inside panel. Contemporary soft lobe to relive muscle strain is light weight and flexible. 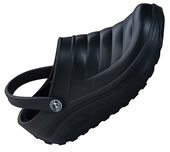 Molded rubber outsole is flexible and provides long wear.